From its mandate in the Geologic Mapping Act of 1992 (http://ncgmp.usgs.gov/about/ngm_act/ngmact1992.html), the U.S. Geological Survey (USGS) and the Association of American State Geologists (AASG, representing the State geological surveys) have worked together to build the National Geologic Map Database (NGMDB, http://ngmdb.usgs.gov/). The NGMDB is mandated to be a standardized, “national archive” of geoscience information (maps and reports, both published and unpublished), made available to the public to support decision-making, research, and other needs. Its website opened in 1996, and it currently serves about 60,000 users each month, who make about 220,000 visits. I’m pleased to note that, from its inception, this project has worked closely with the Library community, relying on its members for guidance and expertise. For example, Nancy Blair (former USGS Chief Librarian) assisted us in defining the data structure for the NGMDB’s Geoscience Map Catalog, and shared the cost of hiring staff to begin the process of testing and populating that Catalog with citations and related metadata. We welcome new interaction with your community, and invite your comments and suggestions. 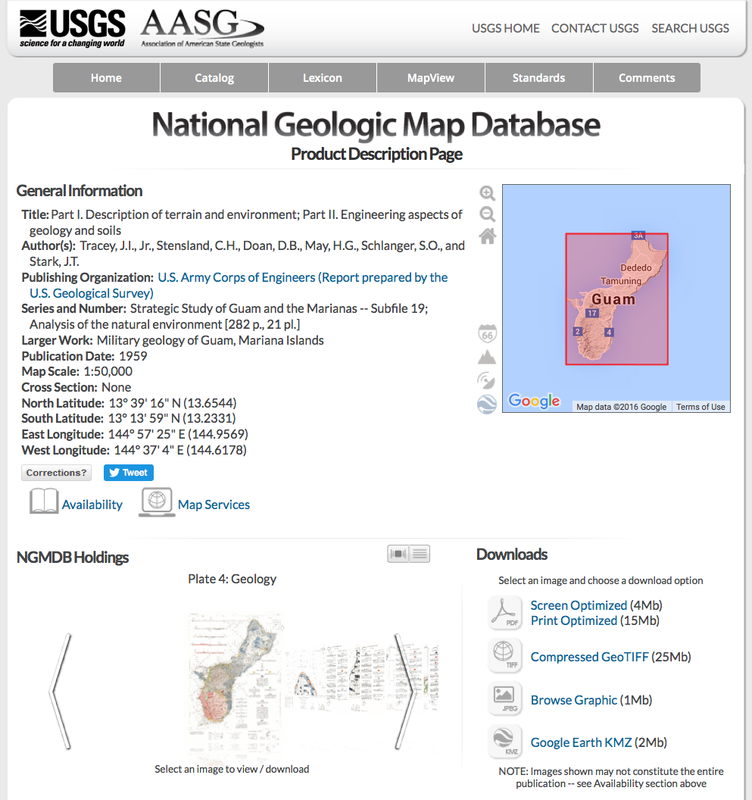 Contains citations and Web links to >100,000 maps, stratigraphic charts, and reports by >630 publishers, many containing GIS data and map images (an example “Product Description Page” is shown in fig. 1). The citation information and Web links are created by the NGMDB staff and the State geological surveys. Checking these records for accuracy is a continual process, especially to maintain currency of the Web links (the number of broken links would be greatly reduced if, when a website was redesigned, URL redirects were used!). For the USGS publications, and for publications of State geological surveys that have granted us permission, we offer inline viewing of the maps, and downloadable files in various formats. The standard reference for the Nation’s stratigraphic nomenclature. The compilation and maintenance of this Lexicon is a complex task that will always be a work in progress owing to the ever-evolving (or simply ever-changing) usage of stratigraphic names by geologists from State and Federal agencies, private industry, and academia. 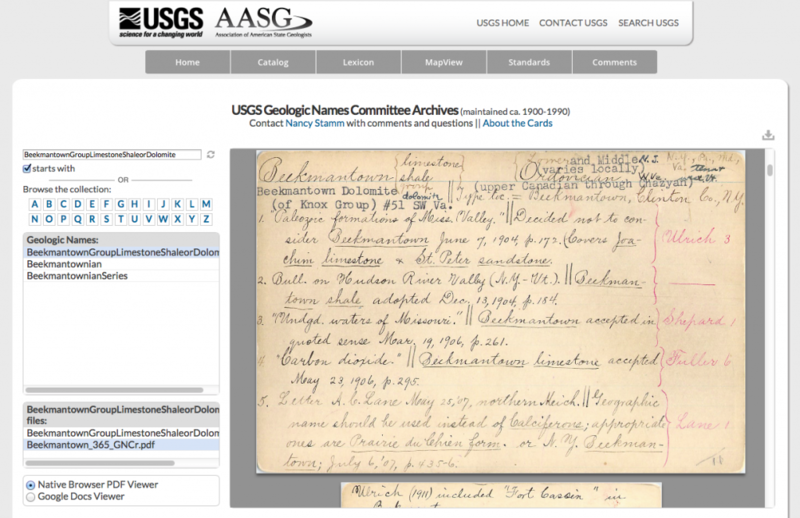 A significant component of Geolex is the set of note cards written by the U.S. Geologic Names Committee, beginning ca. 1900. These cards, some 220,000 in number, were scanned and are available through Geolex as a supplemental source of information (fig. 2). Because digital files are unproven as an archival format, the scans serve as a means to increase accessibility to the (paper) source materials, which are intended to be preserved indefinitely. FIGURE 2: This is one card in a typical Geologic Names Committee (GNC) card-set. Here, for the Beekmantown, a GNC card shows notations on usage of that geologic name in publications ca. 1904-07. Cartographic, database design, science terminology, and data-exchange standards whose development was led by, or assisted by, the NGMDB project (http://ngmdb.usgs.gov/Info/). Notably includes: (a) the FGDC Cartographic Standard for Geologic Map Symbolization, (b) the “NCGMP09” database design, and (c) the various Proceedings and presentations from the twenty annual Digital Mapping Techniques (“DMT”) workshops, which document map-preparation techniques and standards in use or in development by the Nation’s geological surveys. In recent years, the DMT workshops have focused on methods for preserving and stewarding paper and digital maps and reports. As computer technology evolves, and as the scientist’s understanding of how to structure complex spatial information changes over time, the GIS files of published geologic maps increasingly become outdated and difficult or impossible to use in a modern GIS. Examples of complete loss of this “born digital” information are becoming commonplace. In response, we are developing workflows and estimating the financial cost of migrating published GIS files to a standard format (i.e., the NCGMP09 database design). Conversion of map publications to a standard format holds real promise for long-term usability of these files, and offers an efficient means for an institution to manage its data holdings. Participants in the DMT workshops will be preparing a technical document on these issues, intended for use by geological surveys. We would be pleased to consult with the Library community on that document. In recent years, a major redesign of the NGMDB’s database and website was undertaken. 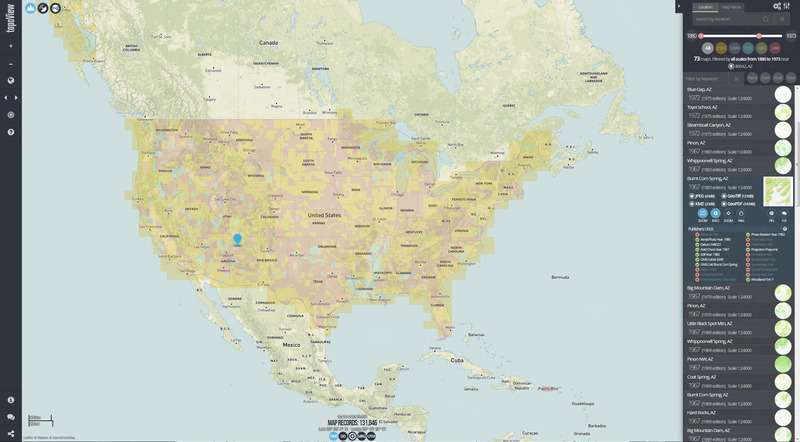 Two new features were added to the redesigned site: (a) “mapView”, which provides a mosaicked view of geologic maps as a new front-end to the NGMDB’s Map Catalog, and (b) topoView, which enables users to quickly search and browse the USGS Historical Topographic Map Collection. At present, these viewers use ESRI’s ImageServer to render the map footprints and images. TopoView’s interface is Leaflet-based, and so it functions on mobile devices. MapView is Flash-based, but will be migrated to Leaflet within the year. In terms of content, mapView (fig. 3) shows the most recent geologic maps at various scales, with direct links to the Catalog search page (in order to find additional publications for the area of interest) and Product Pages (to view and download the publication). The process of populating mapView with selected maps of a given State is lengthy and painstaking. Each publication is evaluated, selected ones are scanned (or the existing scan is corrected), Catalog records are corrected as needed, and a subset of maps is identified and georeferenced for inclusion in mapView. We anticipate completing this work for each State within the next year. 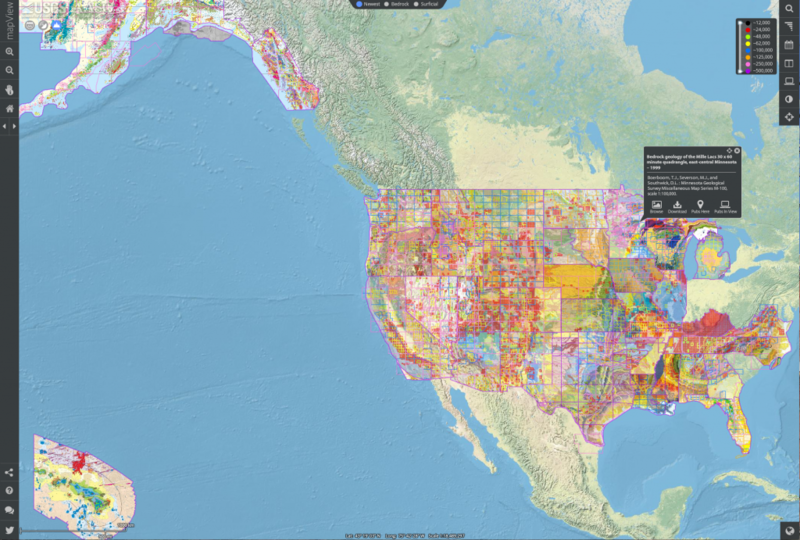 TopoView is our newest initiative; it is designed for users who simply want to browse and download images of USGS topographic maps in various formats (fig. 4). At present, topoView shows the printed maps (the Historical Topographic Map Collection); the digitally-produced “USTopo” maps will be included soon. This is a Beta site, developed in cooperation with the USGS National Geospatial Program (NGP), and will be significantly updated in the next few months. Geologic mapping and topographic mapping at the USGS have a long tradition together (see Powell, 1888), and we’re very pleased to assist the NGP in bringing these maps to the Web. For further information on the project, please see our progress report on the Web (http://ngmdb.usgs.gov/Info/reports/) in publication (Soller and Stamm, 2014). I wish to thank WAML for the opportunity to describe the NGMDB project. We welcome any comments, and look forward to continued interaction with the Library community in the years ahead. FIGURE 3: The mapView interface. Recent geologic maps of Alaska, Hawaii, the Pacific Islands, and 37 States in the conterminous U.S. have been processed into mapView, with the remaining content to be added within the year. In mapView, the user can view maps in any or all of eight scale ranges (see upper right of interface). The black popup box pointing to a map in Minnesota shows the citation for the selected map, with options to view the map or to search the Map Catalog for all publications at that location or in the field of view. FIGURE 4: A preview of the revised topoView interface, which will be released later in 2016. USGS topographic maps of selected areas and time frames can be quickly searched, viewed, and downloaded. Here, the footprints of topographic maps of all scales that were published between 1880 and 1973 are displayed by using the time slider in the upper right corner of the interface. Maps available for the area beneath the blue marker are listed below it — for the sixth map in the list, the various view and download options, and metadata, are shown. Powell, J.W., 1888, Methods of geologic cartography in use by the United States Geological Survey: International Geological Congress, 3rd, Berlin, p. 221-240. Soller, D.R., and Stamm, N.R., 2014, The National Geologic Map Database Project — 2010 and 2011 Report of Progress, in Soller, D.R., ed., Digital Mapping Techniques ’11-12 — Workshop Proceedings: U.S. Geological Survey Open-File Report 2014-1167, p. 125-134, http://pubs.usgs.gov/of/2014/1167/.